Mike Pompeo met with Lebanese Prime Minister Saad Hariri in Beirut, Lebanon on Friday. BEIRUT (AP) — U.S. Secretary of State Mike Pompeo highlighted U.S. concerns about Hezbollah’s ‘‘destabilizing activities’’ in Lebanon and the region in talks with Lebanese leaders on Friday, amid strong regional condemnation of President Donald Trump’s declaration that it’s time the U.S. recognized Israel’s sovereignty over the Israeli-occupied Golan Heights. The abrupt pronouncement was likely to cloud Pompeo’s two-day visit during which he met with top officials, including some who are aligned with the Iran- and Syria-allied militant Hezbollah group. From Israel, Pompeo’s plane travelled through Cypriot airspace, as Lebanon, which is technically in a state of war with Israel, bans direct flights from Israel. Pompeo also met with Lebanon’s powerful Parliament Speaker Nabih Berri, before heading for a working lunch with Prime Minister Saad Hariri followed by a meeting with President Michel Aoun. The State Department’s deputy spokesman, Robert Palladino, said Pompeo highlighted in the meetings U.S. concerns about Hezbollah’s ‘‘destabilizing activities in Lebanon and the region’’ as well as the need to maintain calm along the border between Lebanon and Israel. In his Lebanon visit, Pompeo hopes to step up pressure on the Shiite Hezbollah group, but could face resistance even from America’s local allies, who fear that pushing too hard could spark a backlash and endanger the tiny country’s fragile peace. Hezbollah wields more power than ever in parliament and the government. Pompeo will also meet Friday with the foreign minister. He, as well as Aoun and Berri, are close Hezbollah allies, while Hariri is a close Western ally who has been reluctant to confront Hezbollah. 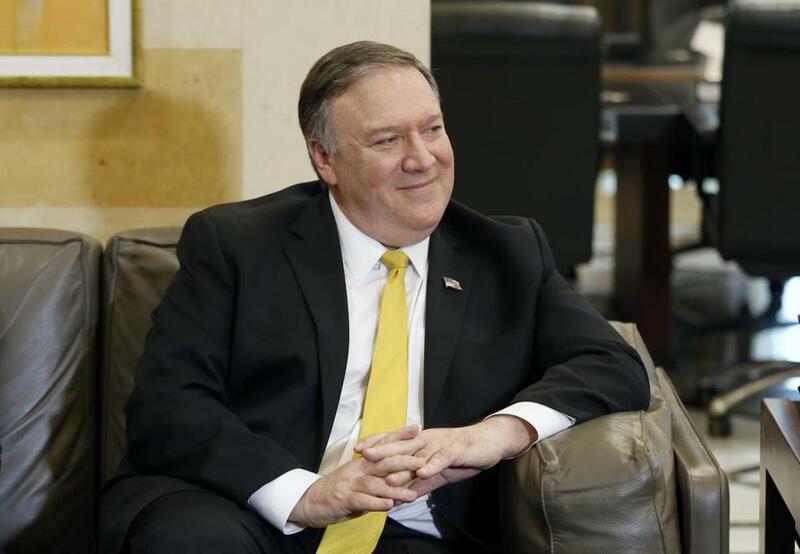 ‘‘We’ll spend a lot of time talking with the Lebanese government about how we can help them disconnect from the threat that Iran and Hezbollah present,’’ Pompeo told reporters earlier this week. ‘‘Hezbollah is a terrorist organization. You ask how tough I am going to be? It is a terrorist organization. Period. Full stop,’’ Pompeo said in Jerusalem on Thursday. Pompeo was likely to announce new Iran-related sanctions from Beirut Friday, expected to include Iranian nuclear scientists and technicians, according to U.S. and Israeli officials briefed on Pompeo’s plans. Speaking to Russian journalists ahead of a visit to Moscow later this month, President Aoun said that the sanctions imposed on Hezbollah, Iran and Syria are negatively impacting the already fragile Lebanese economy. ‘‘The negative effect of the sanctions on Hezbollah is hitting all Lebanese people as well as Lebanese banks,’’ he said in remarks released late. Trump’s statement about the Golan Heights on Thursday is a major shift in American policy. For some time, the administration has been considering recognizing Israel’s sovereignty over the strategic highlands, which Israel captured from Syria in 1967. In a tweet that appeared to catch many by surprise, Trump said the time had come for the United States to take the step. Syria, Iran and Turkey on Friday strongly denounced Trump’s statement.